You work with a variety of Dads. And they've got questions or issues that they need help addressing. And sometimes they're issues you or your staff aren't sure how to answer. Or, frankly, it's just not your area of expertise. From 2006-2011, NFI partnered with the American Humane Society and the Center for Children and the Law at the American Bar Association to establish the National Quality Improvement Center on Non-Resident Fathers and the Child Welfare System (QIC-NRF). Wow! That was a mouthful…but it was a tremendously valuable project that NFI was proud to be a part of. This 5-year project (funded by the Children’s Bureau in the Administration for Children and Families at the U.S. Department of Health and Human Services) sought to identify models that child welfare organizations and professionals could use to improve their engagement of non-resident fathers whose children were or had been involved in child welfare systems. And this is where you benefit. The QIC-NRF produced several excellent resources. One of these, titled “Finding Your Way: Guides for Fathers in Child Protection Cases,” is a collection of 6 FREE guides (each in English and Spanish) for non-resident fathers involved in child protection cases (child welfare cases) that you can download for FREE from NFI’s website. These colorful, easy-to-understand guides are extremely useful for any organization that works with non-resident fathers and especially those who run NFI’s or other fatherhood programs. 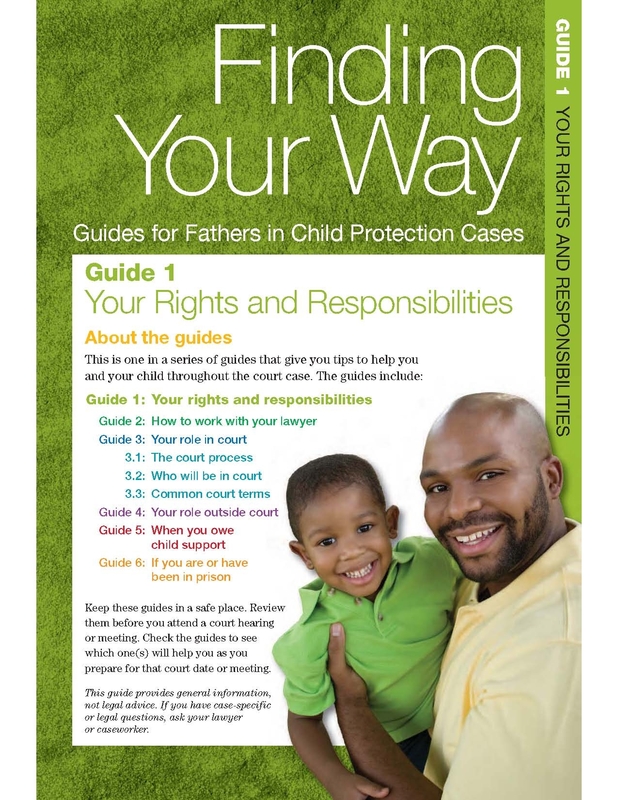 Guide 1: Your Rights and Responsibilities - Includes fathers’ rights in child welfare court cases, how to exercise and protect those rights, and fathers’ responsibilities inside and outside the courtroom. Guide 2: How to Work with Your Lawyer -Includes how fathers should talk to their lawyers and interact with them, what to bring when meeting with a lawyer, and what to expect from a lawyer. Guide 3: Your Role in Court - Includes how fathers should act in court, what to do before, during, and after court, and how to prepare arguments. This guide includes three sub-guides—3.1, 3.2, and 3.3—that cover the court process, who will be in court, and common court terms. Guide 4: Your Role Outside Court - Includes case meetings fathers should attend, why they should attend those meetings, and how to prepare for those meetings. Guide 5: When You Owe Child Support - Includes why paying child support is important, how a child welfare case relates to child support, and when fathers must pay child support. Guide 6: If You Are or Have Been in Prison - Includes fathers’ rights as a prisoner and ex-prisoner, and how fathers can protect their rights while in prison and outside prison. How should you use them? Well, we're glad you asked. We highly recommend that you distribute these guides to the fathers you serve (e.g. via case management or via display in a waiting area). If you run a fatherhood program (such as NFI’s 24/7 Dad®, Doctor Dad®, or InsideOut Dad® programs), keep copies on hand to provide to fathers when they ask questions—which they undoubtedly will—about the subject matter covered in the guides. You can also provide copies to staff to increase their knowledge about how to help fathers who need guidance on how to navigate child welfare systems. And if your organization is connected with other organizations that serve non-resident fathers, please tell them about this great free resource from NFI. We hope these guides are helpful to both you and the fathers you serve!